C.J. Chueca creates walls that neither contain or separate. Instead, they provide insight into the complex ways that walls operate in our lives. Walls serve various functions and speak to different kinds of needs. Walls are the essence of a home, providing shelter and defining the barrier between public and private life. They may be protective enclosures or prisons, designed, as Frost notes above, to keep something in or shut something out. They symbolize exclusivity or inclusivity, isolation or community. In the current political season, the notion of the Wall has become a slogan and a cudgel aimed by one marginalized group against another. C.J. Chueca creates walls that neither contain or separate. Instead, they provide insight into the complex ways that walls operate in our lives. She creates wall sections of plywood and plaster, covering them with ceramic tiles and then abrading, cracking or otherwise defacing their smooth surfaces so that they appear eroded by time, natural disaster or human violence. They have two sides, one the fractured tile, the other the wooden armature that is normally hidden from view. From this perspective, they operate a bit like stage flats, where the frontal illusion and posterior reality tell very different stories. Poignant narratives are hinted at by small objects scattered about the backside of the walls – ceramic replications of cigarette butts, bottle caps, toilet paper rolls and beer bottles seem remnants of lives that once inhabited the spaces that these walls no longer define. These works come out of Chueca’s own nomadic life. Born and raised between Perú and México, she came to the United States in 2003 and has since been living the precarious existence of an artist living in ever gentrifying New York City. But her sense of the uncertainty of life goes further back, to her early years as a student in Peru, where encounters with homeless people, nursing home residents, and psychiatric patients stoked a deep sympathy for the dispossessed, while the abandoned houses in decaying neighborhoods provided subject matter for her early photographs. The works here take up this theme again, now recreating the cracked and broken walls that exist as mute stand-ins for the people who once called them home. Chueca’s walls have a stoic quality, as if they too have endured much and carry on in the face of chipped and broken tiles, exposed under-layers and fractured edges. At the same time, they have a heroic beauty, making deliberate reference to artistic traditions of modernist abstraction and austere minimalism. The pattern of the tiles, in particular, point to the implacability of the grid, which theorist Rosalind Krauss famously noted “announces, among other things, modern art's will to silence, its hostility to literature, to narrative, to discourse.” For Krauss, the grid was the structure that walled modern art off from the rest of the messy world, but in Chueca’s hands, it does quite the opposite. Her tiled walls are full of human and historical associations. They speak of the human desire for security and the violence that thwarts that desire. 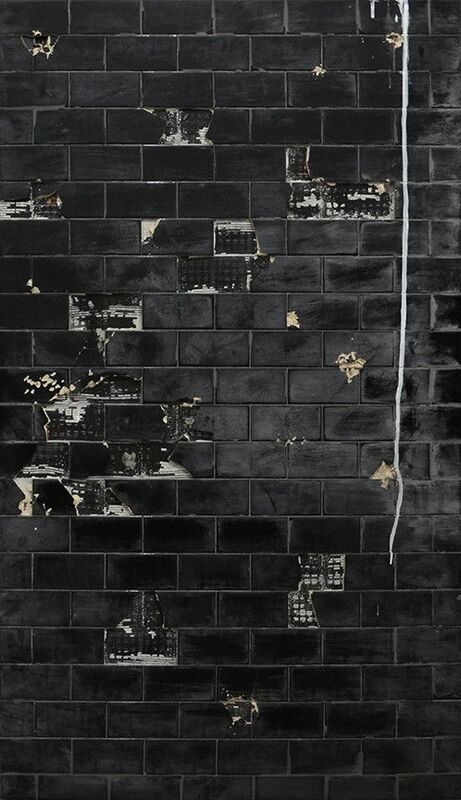 In this her walls bring to mind similarly grid based works like Liza Lou’s prison cells, where beaded tiles suggest white institutional walls stained with grime and sweat or Martin Wong’s lower east side paintings full of meticulously rendered brick walls whose crumbling beauty forms an unsettling backdrop to criminal transactions and furtive sexual acts. Chueca similarly teeters between aesthetic beauty and abject narrative. 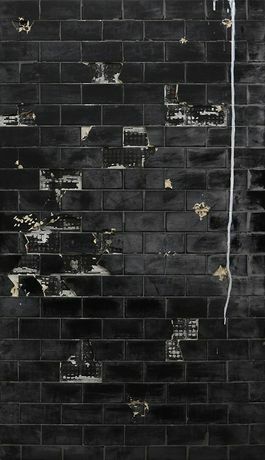 A largely black wall “Body 4 (NY)” has an elegiac quality, featuring black tiles whose regularity is marred by the jagged edges of broken tiles, beneath which we can glimpse the concrete mesh that holds them in place. The monochrome palette evokes Ad Reinhardt’s “last paintings”, in which black signifies the death of art, while a drip of white paint running down the left side seems to pay homage to Barnett Newman’s zips. By contrast, a very large white tile wall with a band of black tiles running across its lower quarter offers more subtle abrasions. Here smears of white plaster lie over certain sections of the wall, suggesting what appears to be a desultory repair job. There is a pathos to the operation, evoking the inadequate patching of a wound. In another smaller wall, no repair has been attempted. Instead, the surface has an odd jigsaw puzzle-like quality marked by jagged holes left by what appears to be a violent attack on the white tiles. But if there is a sense of destruction and demolition here, the works also exhibit a lyrical beauty, perhaps never more so than in a smaller work “Body 6 (NY)” which offers the delicate contrast of pale yellow and white tiles. Scored with tiny breaks and abrasions and draped with drips of amber resin, the subtle composition calls to mind Agnes Martin’s delicate webs of pastel lines and stripes. Accompanying these works are a series of “portraits” of homeless people Chueca has come to know. Originally fashioned from cast off materials, in some cases, they are then hand made in ceramic. Scraps of wood, bottle caps, nails and washers become facial features and heads. These works are at once humorous and touching, evoking the pathos of the discarded elements from which they are made, and pointing to the similar pathos of the discarded human beings to whom they pay tribute. Clearly, Chueca does not share’s Frost’s ambivalence toward the wall. She loves it for its fragility and stoic endurance and embraces its connection to the troubled lives that it has failed to shelter. *P.S. from C.J. Chueca: Angie, I have been looking and looking for you/ station by station/ hoping to tell you/ that this exhibition is for you.